I couldn't decide which post to put up today, so I put up a poll on my FB page. Roasted Potato Salad with Crème Fraîche beat Thai-marinated baked tofu. Stay tuned for that one. The second year we belonged to a CSA farm share something shifted in my brain. I embraced the concept of not knowing what I'd get in the box until CSA day. Now I thrive on the challenge of using all the produce (by eating it fresh or putting it up for later) before the next CSA day. This mental shift in my thinking did not come easily, and it has spilled over into the rest of my cooking. Now I keep my eyes peeled for marked-down grocery items and buy those instead of full-price ones, then figure out what to cook after I get home. It's serendipitous when a recipe I've thought about matches an ingredient that has been marked down. I'm very lucky to have a Danish sister-in-law. 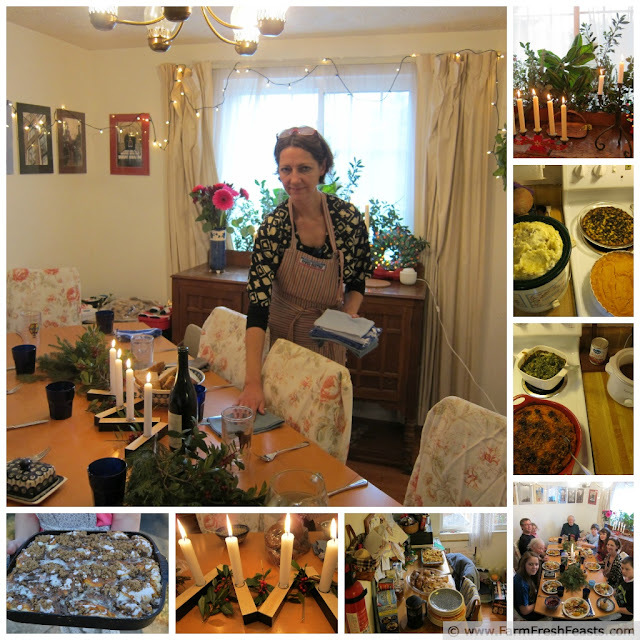 In addition to loving my brother, raising wonderful kids, and being a talented designer (don't get me started on the hand-me-downs my daughter's gotten from her cousins) she's also a great cook and the best sous chef I've ever had. Technically she's the only sous chef I've ever had, but she set the bar very high. Once during a deployment I hosted Christmas and in my little kitchen, with Christine's help, we churned out an American-style Christmas breakfast (complete with overnight yeasted sticky rolls--that's the pan in the corner photo) followed by a full-on Thanksgiving dinner several hours later. Christine chopped, stirred, and washed up like we'd been doing this together for years. And the tablescape? Amazing! Once, while I was visiting Copenhagen, Christine made a simple sauce for our steamed fingerling potatoes. 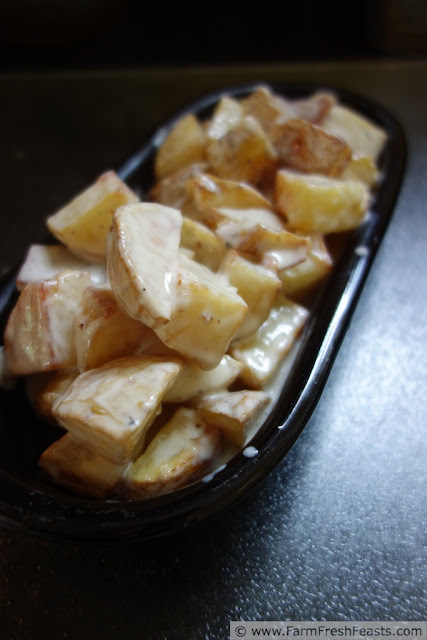 She combined crème fraîche, a little mayo, garlic, salt, and pepper and served a spoonful of it alongside the potatoes. It was, obviously, memorable and every time I make it I think of her. As the weather warms up, my family starts asking for potato salad. What they are asking for is my Confetti Potato Salad. However, my celery isn't ready to harvest yet*, and I don't want to buy any when I know I'll be filling my crispers in a few days with our CSA farm share. Kicking around in my brain was the idea of taking Christine's sauce and tossing it with crispy roasted potatoes for a potato salad. When I saw crème fraîche marked down at the store, that's exactly what I did. This potato salad is like a Little Black Dress--it works on fine china alongside a steak or piled onto a paper plate next to a hot dog. It's tasty hot, or simply warm, and even chilled (my daughter scarfed all the leftovers, so I'm taking her word on that one). I roasted my potatoes, but if you have the grilling skills you could easily do this dish on the road--simply mix up the sauce at home and carry it to the event in a cooler, then when the potatoes are grilled, toss the whole thing together and serve. Preheat oven to 375 degrees Fahrenheit. 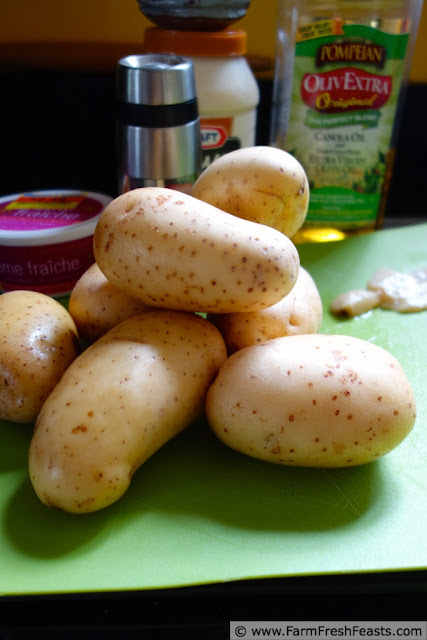 Scrub, rinse, and cut potatoes into bite-sized pieces. In a large bowl, toss potatoes with olive oil, a healthy pinch of salt, and several grinds of pepper. Spread onto a rimmed baking sheet and roast, stirring every 15-20 minutes or so, for 60-75 minutes until they are browned and crispy. 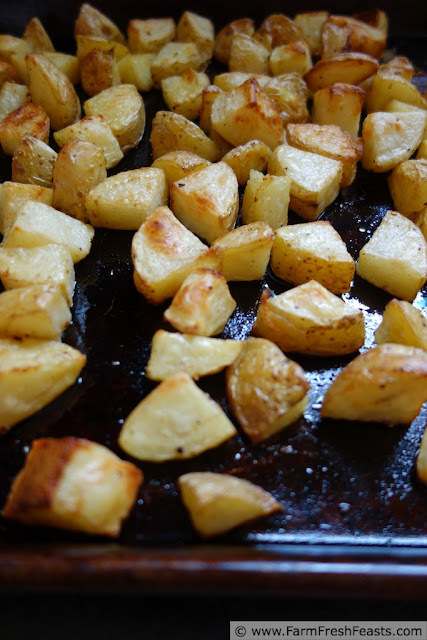 If you've got the oven going at a higher temperature for something else, the potatoes will cook faster so check them with each stir. While the potatoes are roasting, grab another large bowl (or, like me, the same one that's gotten washed--and not by a sous chef) and mix up the sauce ingredients. Combine the potatoes with the sauce, taste to see if you need a bit more salt or pepper, and serve hot, warm, or chilled. *Celery Update: In addition to my garlic, the celery is currently the happiest vegetable in my garden. The regrown plants are thriving since I transplanted them outside last month. I've got a Garden Photos Album on my FB page where you can check it out. After I've harvested, I'll write up the whole celery growing experience, but I've written about the start of it in this blog post. This post is shared with the Clever Chicks Blog Hop, the Wednesday Fresh Foods Link Up and What's Cookin' Wednesday, What's In The Box, and the From The Farm Blog Hop and Food on Friday: Sauces. YUM! I never thought of adding a sauce to roasted potatoes! Thanks for the recipe! I can't tell you where this brainstorm came from--sometimes the idea comes during a shower, like the Chicken Saltimbocca with shredded butternut squash did. Other times it's while walking the dog, which I'm doing a lot of lately. And this is all before I start the official training period! I may need to use my phone not just to keep track of my miles *and* play motivational music but also use the voice notes function for any recipe ideas that occur. Multitasking, indeed. I'm curious how your grilled romaine turns out. At each pediatrician visit, my kids are invariably asked if there is a vegetable that they won't eat. I assume it's to gauge their diet. Both kids will answer "grilled radicchio" because that is my most memorable spectacular vegetable failure. To date. It does seem to pause the pediatricians in their tracks, however, I can only guess because if they are being served grilled radicchio they are probably eating more vegetables than just baby carrots, you know? Kirsten: This is out of this world deliciousness. I would love to give this a try some day. If you've got the ingredients, it's ridiculously easy to make. Please let me know how it turns out! I went grocery shopping today and restocked the fridge and pantry after eating them completely bare pre vacation. I grabbed extra potatoes and now I know why. Your FB post was working on my subconscious overnight. This sounds delicious and I'm going to go to sleep hungry tonight, and I hold you responsible. I can't wait to make these, and I can't wait to get a CSA again....mine doesn't start until mid-late June so I've got weeks yet. And today is June 1, so you can now say "my CSA starts this month" with a big grin. I'm sorry you went to sleep hungry. I'm still craving that cheesy pasta and apple dish of yours, so there. That looks fantastic! I will have to keep this in mind for the next occasion that calls for potato salad. Please do! 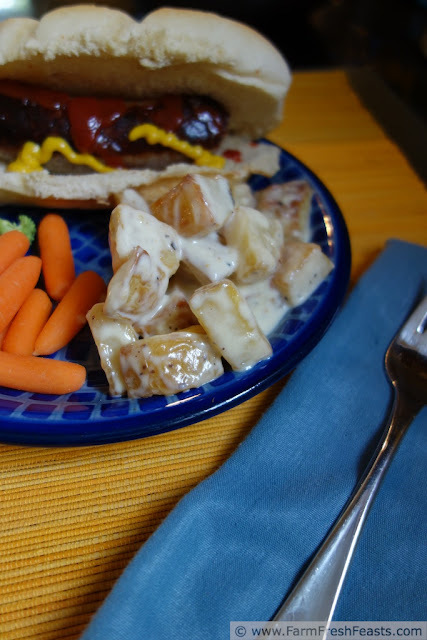 There are so many occasions that call for potato salad, if you ask my kids. Like, today. Or, tomorrow. Or the 3rd Tuesday. They don't care! This looks fantastic! I'm always looking for recipes like this for summer - I'll definitely be trying this one. Thanks, Kirsten! I'm glad to oblige--I love trying new things, and when it's new, but tastes familiar, it's pretty neat. Well this is sure a potato salad recipe to try, it looks great.....Thank you for sharing with the Clever Chicks Blog Hop this week; I hope you’ll join us again! Thank you for sharing this post on our From the Farm Blog Hop. What a fantastic recipe for potato salad. I can't wait to make it when we harvest our heirloom potatoes from the garden. I just pinned this post to a few of my Pinterest boards. I know that my followers will love this recipe as much as I did. I hope that you'll come back and link up again next week! I appreciate you pinning this--I went on Pinterest in April as part of my 30 Days to Better Food Photography challenge, but I have not yet joined because I feel like I don't have time for a new activity just yet. And I know once I get there I'll dive right in and forget to do things like feed the composting guinea pigs or the kids or walk the dog. Luckily everyone, including the pigs, will not hesitate to let me know that they are being neglected. Thanks for stopping by, and thanks for hosting!